Exclusive new polling data shows surprising findings about Arizona's hotly contested race to fill Jeff Flake's Senate seat. Joe Arpaio is falling behind in the Republican Primary for U.S. Senate in Arizona, the new poll from ABC15/ OHPI shows. The poll, conducted April 10 and 11, asked likely GOP primary voters who they would vote for in an August election between Kelli Ward, Martha McSally, and Joe Arpaio. In total, 55% of respondents had a very or somewhat favorable opinion of Arpaio, but the former Maricopa County sheriff only captured 22% of the GOP primary vote. Ward came out ahead, with 36% of the vote, compared to 27% for McSally and 22% for Arpaio. These latest numbers show a huge swing since a January poll, conducted the same day Arpaio announced his Senate run, which had the former Maricopa County sheriff in a dead heat with then-front-runner McSally. In the January 9 results, Ward came in with the lowest percentage of the three candidates. According to the Wednesday poll, 15% of likely GOP voters are still undecided in their primary choice. The winner will go on to face the presumptive Democratic nominee Rep. Kyrsten Sinema in the November general election. Our Arizona senate race is already on the national stage because of its potential impact on the swing of power in Washington. It was October when Sen. Jeff Flake announced that he would not run for re-election . 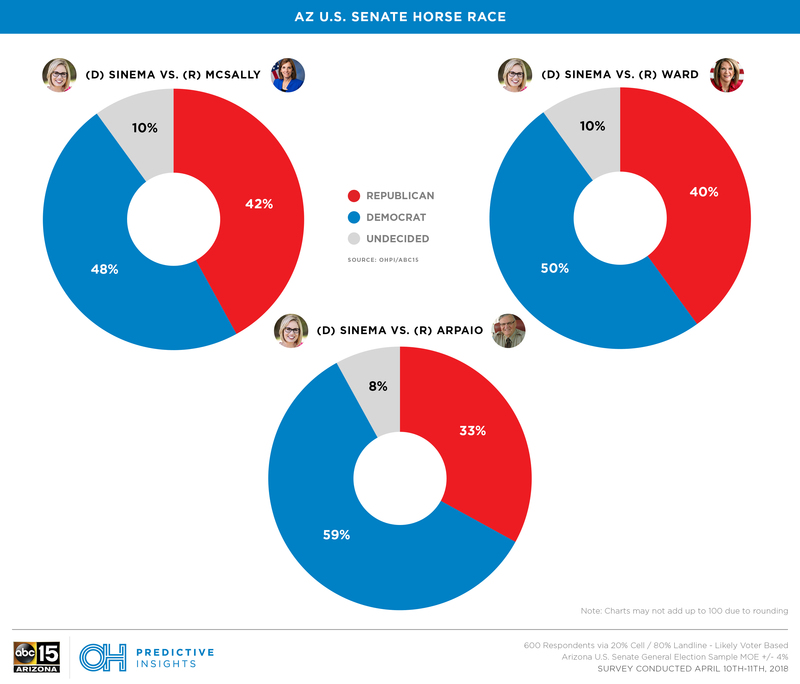 So how does Sinema stack up against all of the Republican candidates in a head-to-head race in November? According to the ABC15/OHPI polling data, the Democrat is out in front to fill the seat previously held by Republican Jeff Flake, and is outpacing her GOP rivals in each of their potential races. In an election facing Ward, Sinema holds a 10% lead, but 10% of likely voters remain undecided. A matchup against McSally is slightly closer, with Sinema ahead by 6% and another 10% of voters still undecided. When paired up in a race against Arpaio, Sinema takes a huge lead, with 59% to Arpaio's 33%, and only 8% of voters undecided. In a historically red-leaning state, a Democrat in the lead may seem surprising. But OHPI polling expert Mike Noble says there are a couple factors boosting Sinema's standing. “The issue we are consistently seeing in the numbers is that Democrats are unified, Republicans are less united, and the all-important Independent voters are trending anti-Republican/Trump” said Noble, managing partner and chief pollster at OHPI. According to the same poll data, Trump's favorability in Arizona is slipping, and that may further account for Sinema's lead. The data shows 56% of likely voters reporting an unfavorable opinion of the president, and 43% responding favorably. Noble said another key factor in the general election is Independents, where Sinema has a significant lead, and where voters' opinions of Trump are "an overwhelming factor." The ABC15/OHPI general election poll surveyed 600 likely voters over the phone from April 10 to 11. The margin of error is +/- 4%. The ABC15/OHPI Republican primary election poll was conducted via phone among 302 likely Republican primary voters. The margin of error is +/- 5.64%. Torunn Sinclair, spokeswoman for the Martha McSally campaign released the following statement to ABC15 on the poll: "No proper statewide survey should include so few interviews, and especially so few cell phone interviews. What I can tell you is that these numbers are a lone outlier, matching neither our internal polling nor publicly released polling, including one released just yesterday. [magellanstrategies.com] "
Zachery Henry, press secretary for the Kelli Ward campaign released the following statement to ABC15 on the poll: "Dr. Ward is heading toward a commanding lead in this race. As Arizona Republican voters begin to compare the three candidates, Dr. Ward's profile as the thoughtful, true conservative who supports President Trump's America First agenda and will stand up to the Washington establishment is resonating. As the campaign progresses, we are confident that the more voters learn about Dr. Ward, the more her support will grow."